Discussion in 'The Shop' started by JohnE, May 16, 2013. Trying to replace the pads on my older M3 and M5...all I can find is Mini pads. They kinda look the same...are they? Dont want to blow anything up or cause the planets to misalign by using the wrong stuff. Or spend 65Euro for the wrong stuff. KnowwhatImean? I've never heard of a Hope M3. Is it the caliper number? And lay off the schnapps Schicklgruber. Its the number on the body of the brake, 5 on the front, 3 on the rear. And I get good hausgemacht schnapps free from my buddy...hard to lay off! Those numbers refer to the caliper half mount leg lengths. Back then, Hope made different caliper (halves) for various fits, rather than needing adapters. I don't remember the conversion but they dictated the mount type and rotor size that the caliper would direct mount to. If it is of the 'M' era, and is twin piston, it is surely a mini. Or spend 65Euro for the wrong stuff. KnowwhatImean? How many are you wanting to buy???????? they should be more like 12.5 euros a pair. 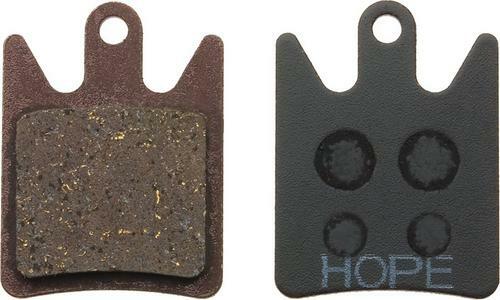 Hell I just checked what I have hanging on the wall and I'm selling Hope M4 pads a pack of 2 pairs for $39NZD in my shop!!! Will put up a pic later...shoulda thought of that earlier! They're the ones I had in mind as well. Would probably fit my E4s too I reckon. Johnny don't pay more than $20 posted to Germany. Had a good experience with an Ebay seller if you're interested. Can't vouch for the actual quality of the pads as only had them for a few weeks but price and postage time was top notch.